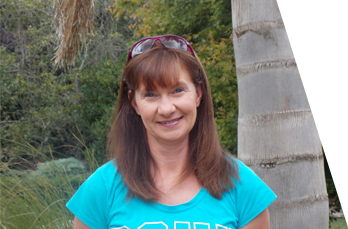 …I help busy business owners achieve their marketing goals and get their business humming. Running a small business can be tough, and growing pains can take their toll. You require all the skills and knowledge found in larger organisations, but only in small doses at critical times. 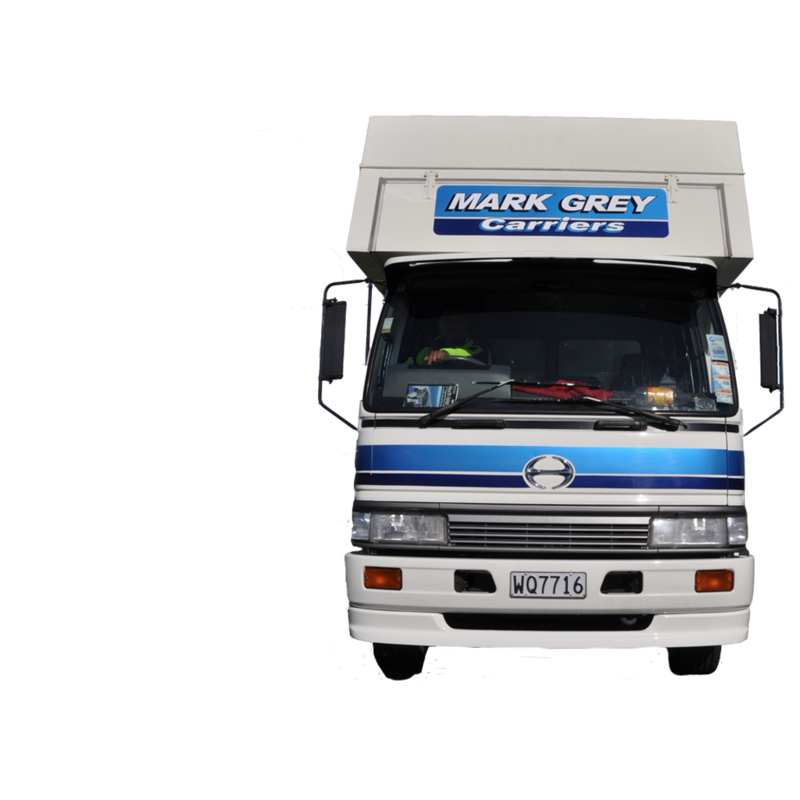 Working with Mark Grey Carriers has enabled me to contribute what they need when they need it, for a fraction of the cost of a salaried staff member. I have assisted with IT projects, the development of a new website, sales proposals, pitches and policies. Along the way I’ve become a pretty useful sounding board for key decisions and learned more than I ever thought I needed to know about trucking! As with most of my clients, we are good friends who can be very honest with each other and that makes a sound basis for any working relationship. It might seem as if automotive repair workshops in Auckland are a dime a dozen, but thankfully the good ones always stand out. Epsom Automotive has developed a loyal following for their friendly, honest service and their ‘phone before we fix guarantee’ and this has led to positive word of mouth marketing. 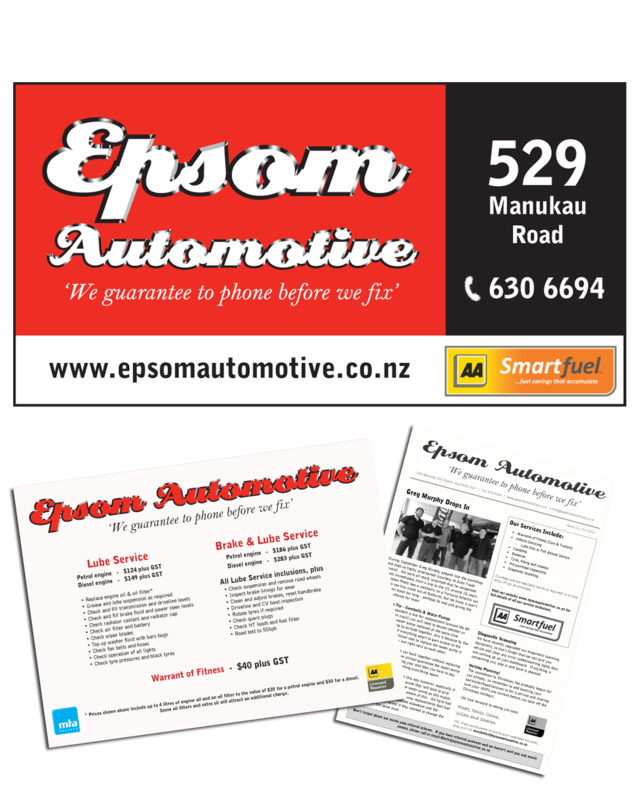 I have worked with Epsom Automotive since 2008, helping them develop a new logo and implement it across the business including signage, website, stationery, service reminders, and regular customer newsletters. More recently, the development of a mobile optimised website and a push to ensure they rate well in online search has delivered pleasing results. As with any small business managing a small marketing budget to best effect means being very considered about the media chosen, carefully measuring results and keeping creative costs to a minimum. I like to think that with Epsom Automotive we have made a little go a long way. A company that specializes in the design and construction of equestrian facilities requires specialist knowledge of horses as well as the ability to build quality, aesthetically pleasing stables. 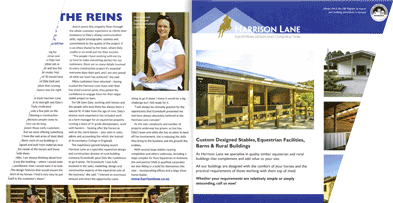 Developing a brand image that conveyed this to affluent horse owners and evoking a sense of trust, the Harrison Lane brand has enabled the current business owner to carve a comfortable niche for herself. Having managed the the initial logo design and website creation, I continue to work with Harrison Lane to update the website and facebook, create regular equestrian magazine advertisements, prepare brochures, e-newsletters, and trade display material. With over 20 years in the New Zealand rental car market Omega has developed an excellent reputation in the tourism industry, but in the highly competitive online marketplace great customer service and a good product is a start but not an end. Managing social media channels, eDMs, web offers, partnerships and the like, I ensure Omega Rental Cars is continually delivering fresh, relevant offers to its potential clients and maintaining a high conversion rate. 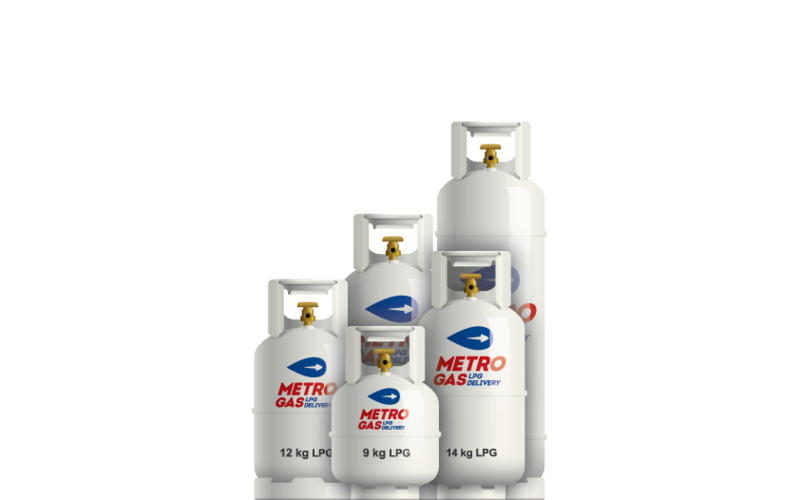 MetroGas delivers LPG on a swap basis across Auckland.  This new Auckland service was launched mid 2013 and is being promoted online and, in order to create awareness of this new offering, on the radio. I worked with MetroGas from the time of product conception to website launch, we implemented SEO and social media strategies and liaised with radio creatives at both MediaWorks and The Radio Network. Sales are building and customers from all walks of life are switching to the MetroGas system. So the biggest question you may ask is "Why didn't somebody do it sooner?" 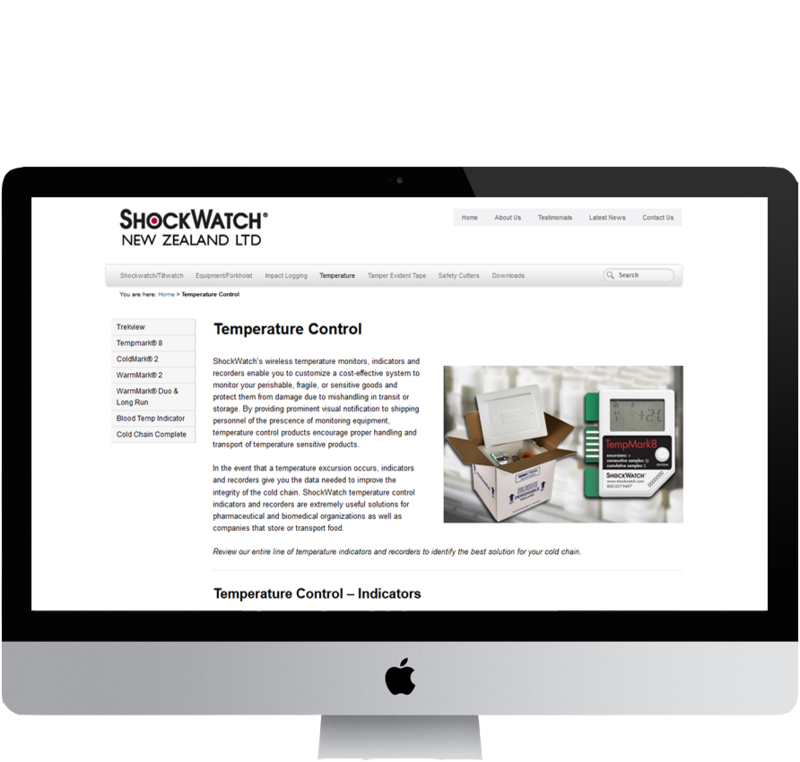 There are a vast array of technical products designed to prevent damage in the workplace and Shockwatch NZ distribute the best of them. But in 2012 their website was looking a little old and not representative of their full product range. Freshening the website with a responsive design created in wordpress, then sorting and loading a massive amount of content has enabled them to better serve their existing customers and attract a decent quantity of new ones. Now, as new products are unveiled, the website is easily updated so the team at Shockwatch can concentrate on converting enquiries into sales. Business facebook pages, twitter accounts, google+ and the like. These days there are a myriad of ways to stay in contact with your customers and prospects. Choosing where you want to be, then keeping up the regular commitment to quality content is always difficult. It's not something you can completely delegate, but it's certainly something I can help you manage. 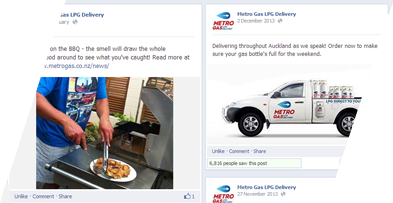 Metro Gas has used facebook to give life and substance to this new brand. 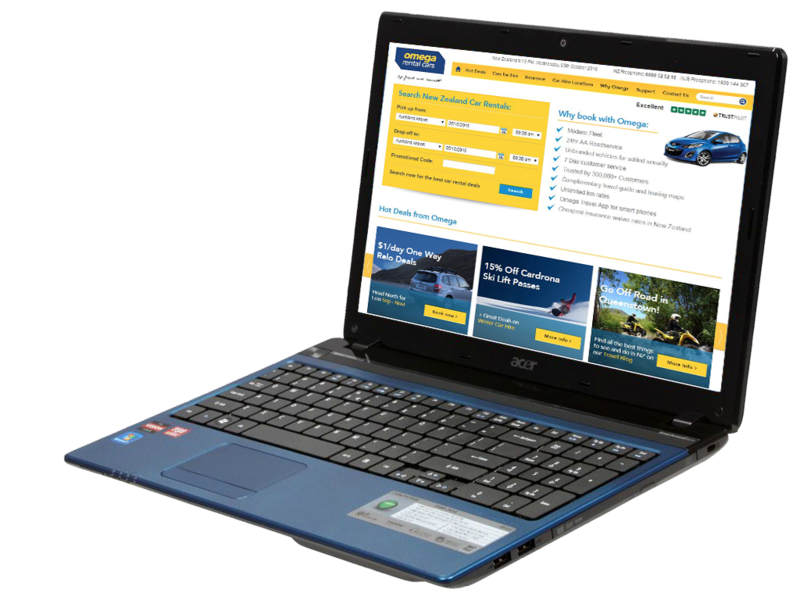 By posting recipes, running a customer competition and drawing attention to their radio advertising Metro Gas helped customers feel comfortable to place an online booking. While it is becoming increasingly necessary for business customers to pay to attract new customers via facebook it still has its place within the overall marketing mix in a business to consumer environment. Radio, print, online and outdoor advertising media can all be considered as part of your marketing mix. I can help you choose the most suitable way to get your message to market, then work to design your adverts and maximise your return on investment, either handling the design inhouse or working with carefully selected graphic designers. I have worked with Harrison Lane since brand conception. Laura has made a strong commitment to advertising in relevant equestrian magazines and websites, as well as committing to industry sponsorships and trade shows. I have worked with her to develop sharp brand advertising materials and continue to evolve the brand to suit the market. Web design can be expensive and I pride myself on finding cost effective solutions. In many cases I can help you develop a professional, content rich website using wordpress. Where you require the services of a fully fledged web design company, I work with a number who are excellent. 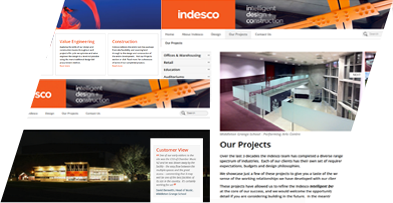 When Econobuilt rebranded as Indesco a new website was paramount, but finding the time to do it was almost impossible. I worked with the team at Indesco to develop a brief and a wire frame design. We evaluated wordpress and worked with Fuse Creative to choose a responsive theme framework and customise it to suit Indesco's requirements. Copywriting and creating project portfolios for their large back catalogue of successful projects gave them a content rich website that is a valuable resource for prospective customers. Unless you do it all the time, wordsmithing can be a time consuming and energy sapping process. Thankfully, help is at hand! Whether you require words for the web, a convincing proposal document or a punchy advert, I'm happy to help. And, if a full PR campaign is required I have experience in that, too. The team at Nautical Contracting are brimming with the kind of no.8 wire expertise that New Zealand companies are famous for. 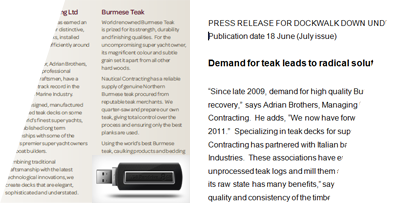 Telling their story to the world in the high end field of superyacht construction was fascinating and highly rewarding. Creating relationships with relevant journalists around the world and writing content to suit their requirements, we were able to secure significant placement in well respected global superyacht magazines and websites. Oncall Communications began when my good friend Rhett agreed that he needed a hand with some words for his newsletters. That was back in 2008 and my work for Rhett at Epsom Automotive has expanded to include a website, rebranding, advertising, SEO, and yes, regular customer newsletters. Word of mouth marketing has led to lots of referrals…I have to say I’m reasonably selective. I only work for people I like, that’s the joy of being self employed. The businesses I choose to work with have a real opportunity to create a point of difference and I take great delight in helping them carve out a niche for themselves. New Zealand and Australian case studies are always a lot more compelling for me than US or UK examples, and Adam’s personal insight into many of the local projects he profiles in this book ensure an insightful read. Adam is a registered psychologist with experience in both criminal and consumer psychology, who switched to applying his understanding of the consumer to the advertising world early in this career. He founded, and later sold, Naked Communications, which has been described as one of Australia’s most influential agencies and has won a string of ad-land awards. So, he has plenty of experience to draw on. From the creation of a campaign for an art-themed Australian hotel inviting guests to steal a painting, to a radio station motivating listeners to ask Richard Branson for money to keep the station running, there is plenty of inspiration to be found between these pages. Understanding the rationale behind the campaigns and why they worked so well, makes this a read for both communications practioners and consumers hoping to avoid being unduly influenced by clever marketers. The primary take-home message is that action changes attitude faster than attitude changes action. So, while many advertising agencies are still producing emotionally charged ads designed to influence our attitudes in the hope that it will change our behaviour, Adam maintains that using action spurs to change people’s actions is far more effective – and attitudes catch up quickly. Great news for those of us lacking the massive advertising budgets of the big brands. But also food for thought when it comes to getting your kids to clean up their room, and helping out on the school PTA. As a consumer, it’ll have you hesitating over clicking on that facebook like button – as this little action signifies a commitment towards this product/company that you won’t even realise you’re making. And while its a 2014 book, rest assured, there’s more depth to this read than a recap of social media marketing trends. Facebook - has it become a waste of time? If you’ve got a business facebook page, chances are you’ve noticed that your posts are reaching fewer and fewer people. Facebook have recently confirmed what we’ve long since suspected, that organic reach is declining. They say this is because more and more content is being created, making it more difficult for your posts to stay at the top of your fans’ news feeds. But they also confirmed that their news feed ranking algorithm is designed to show only the most relevant content to users at the top of their news feed, increasing engagement with these already popular/relevant posts. They deny, of course, that facebook organic reach is dropping because facebook wants to make more money – but then, they probably would say that wouldn’t they? By far the quickest and most effective way that I have found to ensure that a good percentage of your facebook fans see your business page posts is to boost that post for about $36. This increases your reach significantly, otherwise you’re only like to be viewed by around 10% of your fan base. Now $36 is a pretty reasonably advertising price, and so long as you’ve got the ability to measure the return you’re getting from that then its not a bad strategy. And, depending on the kind of content you’re able to dream up, if its engaging and relevant and gets people commenting, then this might not always be necessary. So, in my view, not yet a complete waste of time – but not the free advertising business must-have that it was perhaps thought to be a couple of years ago. We all know that social media has turned the marketing world on it’s head. Not so long ago I was taking to business owners wondering whether their business needed a website and if they could cancel their Yellow Pages advertising to pay for it. Now, it’s assumed Facebook is a business essential and we’re grappling with the need to manage Twitter, Google+ and Linked In alongside it. Easy to think that the world has indeed gone mad. Are marketers just making work for themselves? Have a strategy to begin with. As with any other form of marketing work out who your target audience is and what they could gain from engaging with you on social media. What do you hope to achieve – is it new customers, more sales, improved customer retention or constructive customer feedback. Think about what sort of content you can create and share regularly that will help achieve your goals. Be in it for the long haul. A short burst of enthusiasm for a few weeks won’t get you far. Posting once a week for a year is better than every day for a week. Pick your battles. Facebook may not be the best medium for business-to-business operators, Twitter is more likely to ensure your posts are picked up by newspaper and magazine reporters and if SEO is important you might have to be on Google+. Buying Facebook likes (boosting posts and paying for advertising) is a good way to get your likes up to a respectable level to begin with but won’t get you a loyal and enthusiastic following. Be measured in your use of these tools and be sure that you set up your ads correctly to suit your goals – be that post likes, page likes or clicks to your website. Remember that unless someone has liked your page, not just your post, they won’t see your future posts. Managing social media is a bit like caring for a young baby, just when you’ve settled into a nice routine everything changes! Join social media groups on Linked In, sign up for social media newsletters. Yes you’ll get a deluge of email you’ll scan then delete, but keeping a weather eye on social media developments is important. Without wanting to keep going with the baby analogy for too long, be careful that you’re not posting crap – with each post go back to your strategy, who is your target audience and how does this help them? Keep your content original, check for spelling mistakes, and use eye catching photos. Make it easy for your customers to find you. Share your social media links on your website, in your e-Newsletters, and on your advertising. An integrated approach works best. Measure your results – google analytics can tell you how many clicks to your website (and e-commerce transactions) have come from your social media pages. But like I said before, be in it for the long haul – go back to your original goals and be realistic in your expectations. Fuse Creative is a brand and advertising agency that I have trusted to assist many of my clients with the creation of brand identities that reflect their key points of difference and brand personality. Working from our brief they developed the new name and brand identity for Indesco and we partnered on the development of the Indesco website. This website was developed using WordPress and a theme called Freelancer by Themefuse. If you can find a theme that closely matches the look you are trying to achieve and has all the functionality you want built in, it can save you many hours of website coding and make for a very cost effective website. But not all themes are created equal, and there are those out there that will cause you nothing but frustration when you try to customize them. I am delighted to say that this one has worked really well for me.